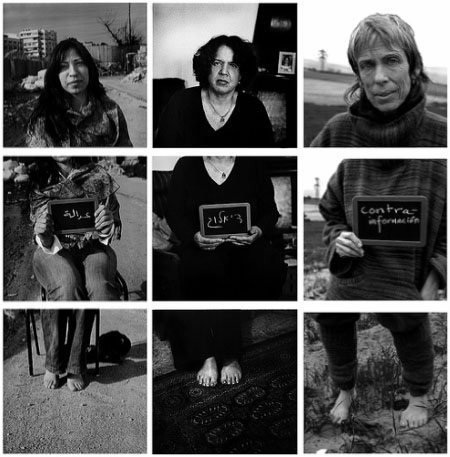 This photo series from 2008 by Spanish photographer Dani Lagartofernández gathers portraits of 13 women working actively to attain peace in Palestine and Israel. They are Palestinians, Israelis, and women from other parts of the world who devote their lives and efforts to achieving an end to the Israeli occupation of Palestine and to the violence caused by this occupation. Many of them are convinced that if women had taken part of the peace talks between the two nations, it would have been possible to achieve reconciliation. As activists and women, they devote their energy and resources to creating an alternative model of negotiation which centers on building relationships through dialogue. 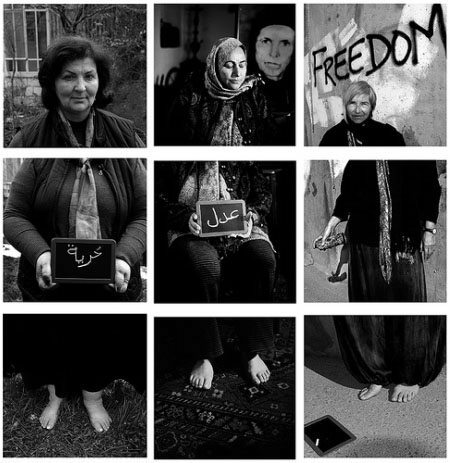 When photographed in 2008, each woman was asked to choose one word to sum up what the conflict means to her. They were all photographed with bare feet, as a metaphor for them staying honest and straightforward in a difficult reality. The women were also photographed in places selected by themselves, representing the interrelationship between the external environment and the inner universe of each of them. Amal is the director of the Palestinian Working Women Society for Development and works to encourage Palestinian women to take part in democratizing civil society. She also is a member of the International Women’s Commission, a movement with Palestinian, Israeli and international women dedicated to end the occupation and achieve peace. She believes that there is a clear connection between Israeli colonialism and gender violence. The arrogant occupation policies reinforce traditional customs and patriarchal structures in Palestinian society. In these circumstances, women are the most vulnerable part of the population. Itaf comes from Daburiah, a Palestinian village near Nazareth. She is the granddaughter of Nasra Awad, who was a midwife, healer and peacemaker in her community. Itaf says that she continues to be inspired by the work of her grandmother. At the age of 12, Itaf took on responsibility of her family. She is now retired, but before that she was in charge of matters related to women at the village mayor’s office. She has always devoted herself to work for peace. Following the footsteps of her grandmother, she is now a facilitator in meetings between Arab and Jewish women. Place: The room in the Daburiah family house where Itaf carries out her work of dialogue, healing and mediation. Angela is from the Israeli Committee Against House Demolitions which works with non-violent resistance to bring the reality of the occupation to Israeli society and to mobilize the international community for a just peace. She opposes the demolition of Palestinian houses, which she considers an act of Israeli cruelty carried out to tell the Palestinians that their land is not their home. For Angela, it’s trust in human rationality that inspires her work. She believes that ultimately, the message about peace will be understood. But she wonders how many people must die before it happens. She also feels alienated in her society when protesting against the government’s settlement policies. In the past, she lived through apartheid in South Africa. From these experiences, she understands that resistance to the Israeli occupation often provokes a violent response. But, she doesn’t hesitate to affirm that Israel acts more violently than the racist South African government did. Mariam is from the Jerusalem Center of Women which was created at the same time as the Israeli women’s center Bat Shalom. The centers are situated on each side of the wall and connected through the joint initiative Jerusalem Link. This is the first time a Palestinian and an Israeli organization work in this way to improve the situation of human rights, and women’s rights in particular. Mariam is a survivor of a reality in which desperation reigns. Especially after September 11, this is a reality where Palestinians are stigmatized and seen as terrorists only due to the fact that they are Arabs and (sometimes) Muslims. Mariam is fed up with explaining the fact that she is both a Palestinian and an individual, and she is tired of justifying why Palestine is a nation in resistance. She knows that her human rights work is important, because the Palestinian woman is the one who has to bear the brunt of the Israeli occupation. After fighting daily to educate children and trying to preserve order in the house in an unstructured society, she is also a victim of gender violence. Nurit is a university teacher with a degree in comparative literature. On September 4, 1997, her teenage daughter Smadar was one of four victims of a suicide attack perpetrated by a Palestinian kamikaze in West Jerusalem. Although plunged into mourning, Nurit didn’t hold the Palestinian people responsible for the death of her daughter, but the policies of Benjamin Netanyahu’s government. In 2001, Nurit received the Sakharov Prize for Freedom of Thought, a prize awarded by the European Parliament to persons or organizations fighting for freedom and human rights in their countries. Place: Nurit’s house, where she says she works best, in West Jerusalem. Tal belongs to MachsomWatch, an organization that monitors the behavior of soldiers at Israeli checkpoints. They observe and write testimonies of what they see, in order to protect the rights of Palestinians. 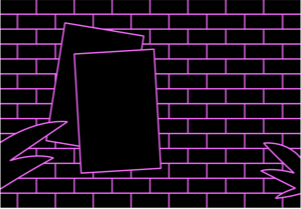 “This way, nobody will be able to say in the future that they didn’t know,” says Tal. Place: An agricultural area near Tal’s house in Neveh Sharet, a suburb of Tel Aviv. Tala had been traveling every week during one and a half years to the Hawara checkpoint near Nablus, when she discovered one day that some inhabitants of the Balata refugee camp, close to Hawara, came from Al Sawalima, a small Arab village destroyed in 1948. That village was in this field, only three minutes away from her house. The interviews were made in 2008, at which time the women worked with the said organizations.